Do you need help with garden clearance in Lower Edmonton? We have the perfect remedy! For more than a decade we’ve been delivering garden clearance Lower Edmonton householders turn to and heartily recommend to neighbours, relatives and colleagues. They love our fast, flexible services and economical prices. And we expect you will too! Garden clearance is a thankless task and then there’s the question of what to do with all your garden waste. But with Away With It garden clearance couldn’t be easier. Our flexible, fast and competent staff will remove all of your garden refuse in no time at all. And at a price that’s a lot more affordable than you might think. Paving slabs, walls, fence panels and posts. And we will sweep and rake up afterwards leaving your garden immaculate and tidy. We are licensed and insured waste carriers. 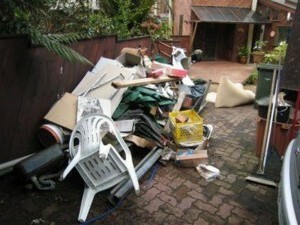 You can depend on us to do an altogether professional job and handle all your waste the right way. Our business hours are 7am to 11.30 pm seven days a week. Evening and weekend appointments can always be scheduled for your convenience. We provide a quick, same day removal service. Any time you need us we are just a telephone call away. Appointments are made it two hour slots and we’ll always call ahead of time confirm you know when we’ll be arriving so you’re not left hanging about. Our simple pricing policy means there won’t be any disagreeable bombshells when the job is finished. The price we quote is the price you will pay without any hidden extras. We always sweep up when we’ve finished clearing your rubbish and leave your home tidy and clean. 80% of the waste we collect is recycled. The rest is disposed of responsibly. To discuss your requirements for garden clearance Lower Edmonton phone us today on 0208 504 7390. We’re here 7 days a week from 7am to 11.30 pm to answer your call. Our knowledgeable team will be happy to answer your questions and give a cost effective free estimate. Or you can submit your particulars using our simple request a quote form and we will respond to you fast.